3 day Surf lesson packages provide you with 3 x 2 hour surf lessons. 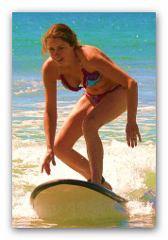 Each lesson will progress your skills from an entry level surfer to competently riding waves to the beach. Meet at the Surf the Bay van, walkway Bridge at Dalmeny Beach. 2 hour group surf lesson, maximum of 8 participants to 1 instructor. Clients will be divided into small groups depending on prior surf skills. Meets at the Surf the Bay Van located at the foot of the walkway Bridge, Dalmeny Beach Narooma. 1 on 1 private lessons are $100. Add up to 3 friends for only $50 per person. Lessons run in the pristine waters of the Wagonga Inlet, Narooma. Meet at the Surf the Bay Van located on Riverside Drive near the Quarterdeck Cafe, Narooma. .
5 day Surf lesson packages will provide you with 5 x 2 hour surf lessons which in most cases will run on consecutive days. Lessons will progress your skills from an entry level surfer to turns/manoeuvres and riding green waves. SURF THE BAY GROM PACK: This 5 day surf lesson package is exclusive to all the aspiring young surfers, progressing them from beginners to accomplished surfers whilst having fun with friends. Lots of goodies received upon completion. Private Surf Lessons are perfect for beginner surfers that feels they need a little more individual attention to develop their surfing skills. They are also ideal for intermediate to advanced surfers that need a little focus on specifics.